At the time of their acquisition it seemed remarkable enough to have found two unrecorded armorial Delft pilgrim bottles, intact and complete with lids from the end of the seventeenth century with a provenance dating back to the 18th century. 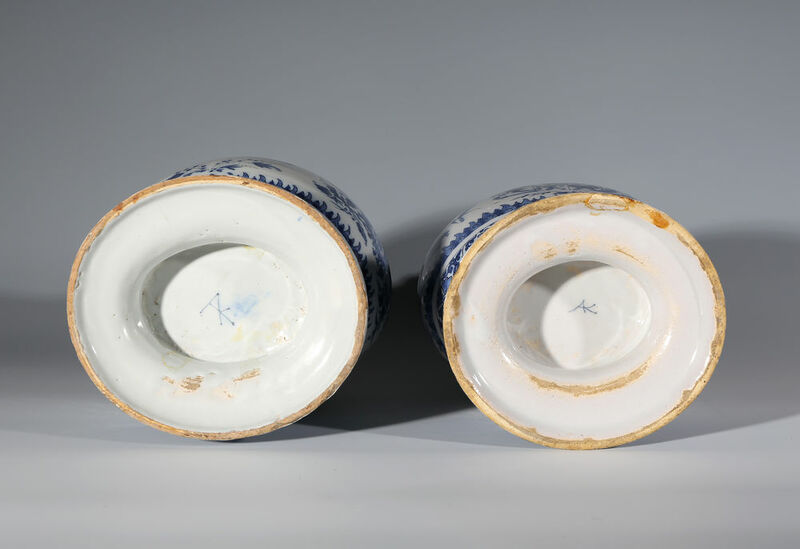 Further research undertaken by Drs Marius van Dam has revealed the backgrounds of the Swedish noble family Hastfers, and it became clear that these vases must have been a gift from Stadhouder King Willem III to Jacob Johann Count Hastfers. Furthermore we realised that the two bottles were made in two different, but intimately related factories which has enabled us to pinpoint their date of manufacture precisely to within a few months. Two bottles, two potteries and a master pottery painter. 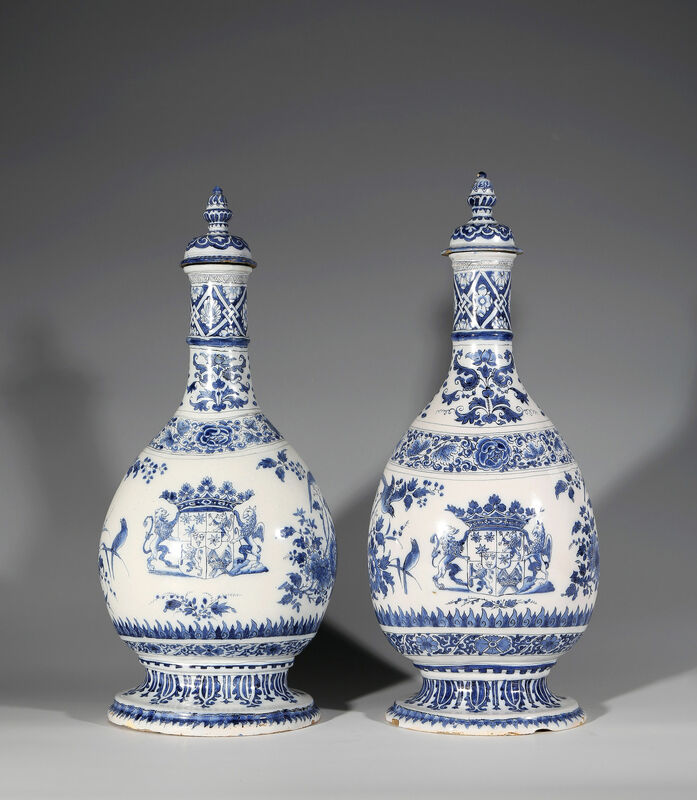 The two pilgrim bottles are painted in blue with the coat of arms of the Swedish family of Count Hastfers between bands of ornament derived from Chinese porcelain of the Transitional Period and others of the classic baroque in the manner of Daniel Marot. Both bottles are marked on the base with the ‘AK’ monogram for Adrianus Kocks of the ‘De Grieksche A’ factory, one bottle also bears faint traces of a ‘IW’ monogram for Jacob Wemmersz Hoppesteyn of ‘Het Moriaenshoofd’ factory. That one of a pair of two vases has two different factory marks is very unusual. Perhaps an order of a few specially commissioned vases was initially awarded to the Moriaenshoofd factory and after an ‘accident’ had been finished at ‘De Grieksche A’ factory of the Kocks family after having also put their own mark on the copy of the ‘competitor’. In technical terms, over-marking can be done by sanding the enamel off the bottom, adding another mark and applying a transparent lead glaze over it and firing the whole again. If such a thing has happened then there must have been a plausible explanation. The organisation of a pottery was more or less the same everywhere in the Netherlands in the seventeenth century. There was an owner who had done a guild trial to become a member of the guild who handled the business side of the company. Occasionally they worked with a deputy and /or a manager who also had to pass the guild test and was financially responsible. In the factory there was a division of labour, which meant that there was a strict separation between the workers who were involved in the preparation of the clay and the glazes, those who occupied themselves with the formation of the products and those who were occupied with the filling and firing of the kiln. The painters’ workshop, which was led by the ‘first painter’, was completely separate. In one case the business was so extensive that there were two kilns in use and in some cases it is known that under the ‘first painter’ there were two young people with ambition but also with a lot of mutual rivalry as both jostled to succeed their master. Rochus Jacobszoon Hoppesteyn the owner of ‘Het Moriaenshoofd’, in the 1680s, evidently had little control over two successive ‘first painters’. The behavior of these men, Jeremias Godtling (1642-ca 1703) and Gijsbrecht Claesz Verhaast (life dates unknown but he had four children in Delft between 1692 and 1699) may, to say the least, be called self-willed. The ‘De Grieksche A’ pottery was owned by three generations of the Van Eenhoorn family from its establishment in 1658. In the period in which these two pilgrim bottles were made, it was run by Adrianus Kocks. The shape and painting of the two pilgrim bottles are more or less the same, but there are striking differences in the arrangement of the elements that make up the decoration. The placement of the family arms on the first bottle is placed nicely in the middle of the belly whilst it is a little lower on the second. Also the height of the band with stylized tulips is lower on one than on the other. One might assume that when painting such a set of bottles, use was made of a set of ‘pounces’ or pierced stencils, that the painters in the Dutch pottery industry used in almost all cases and with the help of which a pair could more or less be identically painted. It could be that the painter of the second bottle no longer had access to the original pounces and had to use a new set with or without the first bottle as an example. This is a plausible explanation for the striking differences in the arrangement of the decor. The first bottle not only has the AK monogram but also a faint monogram IW for Jacob Wemmersz Hoppesteyn, former owner of the pottery Het Moriaenshoofd and whose initials were used in the pottery long after his death. This indicates that the first bottle was made, marked and painted at the pottery Het Moriaenshoofd, and a few weeks or months later it was marked and fired again in another pottery, De Grieksche A; whilst the second is made entirely in the De Grieksche A pottery. It was normal for a worker from one business to join another in Delft, but bringing along a half-finished order, was unusual. Jacob Wemmersz Hoppesteyn died in 1671, but his widow continued the business, presumably without much change to the management. In order to prevent any problems with the guild as a woman, she married the master servant of the company, Willem van Teylingen shortly after the death of her husband. This second husband died in 1679 and her son Rochus Jacobszoon Hoppesteyn took up the position of guild member. After she too had died in 1686, Rochus became the owner of the business. He survived his mother for six years (died March 1692). A new mark was introduced under Rochus but the date of introduction is not known, it is possible that both marks were used side by side for reason that are not clear. The coat of arms indicates that the two pilgrim bottles must have been painted after 1687 and prove that the IW mark was still in use after the death of mother Hoppesteyn in 1686. This is in contrast to the suggestion that the IW mark was probably no longer used after her death. After the death of his mother in 1686 Rochus Hoppesteyn relied heavily on the ‘first painter’, Jeremias Godtling, who besides his main task in the company was also the first, and for a long time, the only one in Delft who mastered the so-called petit feu technique, where, gold and red could be fired into the glaze. Godtling left on 17 September 1688 to start his own pottery business in The Hague . Apparently, none of the pottery painters in the company was able to take on the role of ‘first painter’ and Rochus Hoppesteyn quickly engaged a new master painter, Gijsbrecht Claesz Verhaast. He was able to exploit his position of power to his advantage and worked a lot at home, presumably also for other potteries. This caused considerable problems with the junior painters and employees of the company already filed a complaint against Verhaast by1689 . In addition to problems with the workforce, there were also financial difficulties in the company and Rochus Hoppesteyn decided to split his business in the course of 1690. On 28 September 1690 he sold one part, under the name ‘Het Oude Moriaenshoofd’, to Nicolaas van der Planck. The other part continued under the name ‘Het Jonge Moriaenshoofd’. He evidently also had domestic problems, in December 1691, among other things, a maid observed that Rochus hit his wife constantly and on 25 March 1692 Rochus died, leaving the estate insolvent. From outstanding debts of the insolvent estate to the business of Jeremias Godtling in The Hague it appears that Rochus sent semi-finished products to The Hague to have them finished there in a petit feu firing. An employee who sees a chance to take a half-finished commission to a competitor will only be able to do this when a business is in a state of chaos and when owner has lost control, such was the situation at Het Moriaenshoofd in 1689-1690 and at the Jonge Moriaenshoofd in 1691. Because the double-marked vase has the mark of father Jacob Wemmerszoon and not of son Rochus, the first half of the year 1690, before dividing the factory into two new businesses, seems to be the most likely date for the situation outlined above. This technical and art-historical curiosity could have been possible in practice during the entire period that Gijsbrecht Claesz. Verhaast was ‘first painter’ at Het Moriaenshoofd, but only logically after the complaint of his co-workers in the company in September 1689 and before or during the complete collapse of the company in late summer of 1690 and eventual total mental breakdown of Rochus Hoppesteyn in the autumn of 1691. It may also be assumed that Verhaast was the first painter to take on this important assignment. It was a considerable sized pottery, but certainly not so big that more than one very experienced painter was employed in the company, let alone a second ‘first painter’. With the current level of knowledge about the Delft pottery industry we cannot say with certainty how such an important assignment could have been transferred from one pottery to another, and who ultimately decided on it. It is possible that one of the two vases failed during the production process because it was broken or the colour had bled, for example, and that the headstrong Verhaast himself went to the competitor, although the clear monogram of Adrianus Kocks on both bottles does not suggest this course of events. Probably the client found the process so chaotic that he himself decided to let the Greek De Pottery make a second vase. The first owner, Jakob Johann Count Hastfers (1647-1695). On both sides of the bottles are the arms of the Swedish family Hastfers. This family was only given the title of Count in 1687, before that they were of lower nobility. The male line in the family died out after eight years, in December 1695. Count Jakob Johann of Hastfer (Tallinn 1647-1695 Riga) was a son of Ewold von Hastfers († after 1678) and Emerentia Veronika von Mengden († 1676). In 1678, Hastfers was made a freeman of Kostfer and Middewa into the Swedish Freiherrenstand, and in 1687 entered as count of Gripenborg into the Swedish nobility. In 1674 he married Sigrid Gyllenstierna from Lundholmiga (1638-1700). They had three daughters and one son, Count Ewold Hastfers. The son Ewold died at Namur in 1695, with which Hastfer’s branch of the family became extinct. In 1686, Hastfers became Governor-General of Livonia. In 1687 he was a royal counselor with the rank of lieutenant-general of the infantry and in 1690 he became a field marshal. Hastfers was a key supporter of the reestablishment of the University of Dorpat by the Swedish King Charles XI. In 1690 he became Chancellor of the University. He was also the heir to Wibyholm, Claestrop, Sidholm and Mellerd. 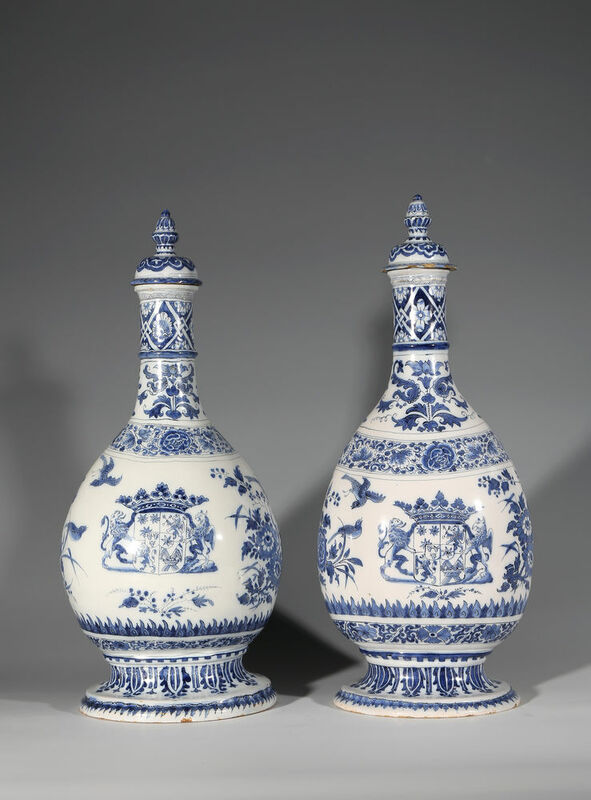 These bottles were most likely ordered in Delft as gifts for Jacob Johann Count Hastfers. Although it cannot be excluded that Hastfers himself ordered these bottles, this is unlikely. Pilgrim bottles in silver were, in the last quarter of the seventeenth century the pièce de résistance of a royal silver buffet, but also a gift par excellence for and by the high nobility. William III gave William Cavendish, 4th Earl of Devonshire, in or shortly after 1688 two silver pilgrim bottles with the Cavendish coat of arms, but William III did not have them made in London but ‘at home’ in The Hague by the silversmith Adam Loofs. In this way the products country could also be promoted abroad. So it is understandable that Delft bottles were given in this case. It was ensured that the pottery industry of Delft was brought to attention abroad. It was probably not Willem III himself but Anthonie Heinsius (1641-1720), the Grand Pensionary (Raadspensionaris) of Holland who would have placed this order. During the reign of William III and his stay in England, Heinsius was his faithful and competent agent in the Republic. Before he became The Grand Pensionary (Raadspensionaris) he had been a Veertigraad (member of council of that name) in Delft. As a born and bred resident of Delft, he will have been familiar with most of the potteries and he most probably placed the order with Hoppesteyn, at that moment artistically, the most important factory in Delft. The model of the seventeenth century pilgrim bottle was derived from Italian sixteenth century examples. Despite the fact that the model was already about 150 years old at that time, pilgrim bottles were seen as highly fashionable in this period. They can be seen on the table in the dining room at Paleis’t Loo, designed by Daniël Marot. It was common in the seventeenth century, as it is now, to support a city’s or province’s own commerce by giving prestigious orders to the local industry. The products that were manufactured could then serve not only as a gift on occasions but also as advertisements for the country, the city and the quality of the Dutch product, in the hope that later new orders would follow. The city of Delft, of course, gave gifts of Delft pottery as presents, occasionally mounted with silver . Also the two dishes that have been preserved in the Musée National de Céramique in Sèvres with the arms of France and Navarre, dated 1663 and those with the arms of the minister of finance under Louis XIV, Jean-Baptiste Colbert, will no doubt have been diplomatic gifts from the Netherlands . Likewise in the 17th century, the Staten Generaal (the Dutch government) regularly donated damask from Haarlem with woven arms as diplomatic gifts to princes and high officials. As mentioned earlier, it is unlikely that Hastfers himself ordered the two pilgrim bottles in Delft in around 1690. Sets of pilgrim bottles were a standard diplomatic gift, decorative pieces without a practical function in the dining room whilst the orders of the high European nobility in Delft consisted, as far as we know, mainly of wares that were to be used. For example, around 1685, Wenzel Ferdinand prince Lobkowicz ordered from Lambertus Cleffius, owner of the De Metale Pot, an extensive service painted with the Prince’s interlaced monogram. No pilgrim bottles were included in this order. Very few pieces were specially ordered. These special commissions were often marked with a date and sometimes the initials of the owner. For such objects too, it may be assumed that form and painting has been explicitly agreed with the potter by the person who ordered it. In the case of an official gift, the description of the wishes of the commissioner will have been much more explicit and much more detailed. For the pilgrim bottles being discussed here, a silver example would have served as model, but possibly only via an accurate drawing including the coat of arms and that the decoration, in the most current Chinese taste, was discussed with the owner of the pottery and/or his head or ‘first painter’. Sweden and the Great Alliance in the Nine Years’ War; Place of William III in the international politics of those years; or what was the reason for William III to give a gift to Hastfers? In order to understand how and why William III distributed gifts to a Swedish citizen on behalf of the Republic, it is necessary to outline the political situation around 1690. In the Netherlands Stadholder William III had been in power since 1672 and in February 1689 he was also crowned King of England. In France at this time, Louis XIV’s foreign policy was aimed at expanding his power base and his territory. In the last quarter of the seventeenth century, the countries around France were therefore always wary of French aggression. The Nine Years’ War (1688-97) – often called the War of the Grand Alliance or War of the League of Augsburg – was a conflict between France and a European coalition of Austria, the Holy Roman Empire, the Dutch Republic, Spain, England and Savoy. It was fought in Europe and the surrounding seas, North America and India. It is sometimes considered the first global war. William III attempted to bind the anti-French allies together by signing Alliance treaties. The anti-French alliance was aimed at allies supporting each other in the event of a French attack, regardless of where that would take place. To maintain the alliance William III endeavoured to maintain a balance of power in Europe and many obstacles had to be eliminated. Each (potential) participant in the alliance came up with demands that had to be negotiated so many discussions were required to create and maintain the alliance. In public or in secret, one-to-one or with a large entourage, by correspondence or in person, the negotiations took place in the most diverse forms. The Scandinavian countries Denmark and Sweden had been in conflict several times in the decades prior to the Nine Years’ War. The balance of power between the Baltic States during this period was more important for the Scandinavian countries than the balance of power on the rest of the European continent. Yet these countries were also seen as an important part of the whole. Both Louis XIV and William III made energetic efforts to convince the Swedish king, Charles XI, or the Danish king, Christiaan V, to support their camp. An enemy in the north would confront the Holy Roman Empire with a war on three fronts (alongside the Turks in the east and the French in the west), something that could accelerate the expansionism of Louis XIV. Obviously, it was absolutely necessary for William III to prevent this happening. Diplomatic jousting in Sweden, important on the northern flank of the Alliance. Convincing the Swedish king to join the Grand Alliance was cautiously handled. The king himself was not directly approached. Diplomats had to get accessb to the king via high ranking advisors at the court. To please these advisors, gifts were given first and then pensions were promised. Hastfers was one of about ten important Swedish noble advisors who regularly stayed at the court in Stockholm and was considered to have an influence on the course of affairs in Sweden. It was remarkable what the Stadholder King achieved in those years and at what speed. In 1688 he was busy forming an army for an invasion of Great Britain to overthrow his father-in-law, James II, and at the same time he was forging alliances in Europe against France. In February 1689 he was crowned king of England and, a few months later, during the summer, having hardly finished consolidating his power in England and with a considerable battle ahead in Ireland, he was already putting the English diplomats in Sweden to work. Thanks to the The Grand Pensionary (Raadspensionaris) in The Hague, who he could trust blindly, all was running smoothly in the Netherlands and also there they were working on the Swedish case. The rivalry for Sweden began with Duncombe’s mission of July 1689, hotly followed by that of Bidal, Baron d’Asfelt for Louis XIV. Both the French and the allied side were prepared to use money. By early September 1689 William III spurred on partly by rumors from Germany that the French were preparing to offer money to Count Oxenstierna, arranged to send £2,000 (8,000 Swedish Krone). This gift was well enough received to spark off negotiations for a regular pension for Oxenstierna, the English share of which was set at £2000, the other participants being the Dutch, the Emperor and the king of Spain. The French bribed Count Bielke, so each side had secured a major figure in Swedish politics in the first year of the war. Though William’s allies never paid their share, or lapsed in their payments when they found that Oxenstierna had not been able to do what had been expected from him, William himself stuck to the bargain: Oxenstierna’s pension admittedly often in arrears, was ultimately paid, however difficult it was at times to find the money from the English ‘contingencies of the war’ or from the secret service’s money. Oxenstierna indeed was paid even when his policies were suspect; and in times of crisis he received extra presents over and beyond the pension, which continued to the end of his life. During the war Oxenstierna received at least £20,000 for himself, and his wife received valuable presents and at least one gift of money. His son got promotion in the Dutch army generally thought to lie beyond his military capacities, and probably also gifts of money. Great secrecy was insisted by Oxenstierna. The chancellor’s secretary had to be in the know, since he had the task of reminding the English diplomats in Stockholm when the pension was overdue. This secretary was himself paid a pension by William III of £ 300 a year from 1693 onwards . The fact that the elderly Oxenstierna was often ill created problems for William. As early as January 1690, he expressed his willingness to put £4,000 at Duncombs disposal if ‘other ministers could be gained’. Of this proposed amount £1,000 was actually paid to Gyldenstolpe in 1690, while a rather lavish gift, a portrait of Queen Mary valued at £500, was given to Gyldenstolpe’s wife. Attempts were made on Oxenstierna’s advice, to give money to Akerhielm, but this official stubbornly refused to accept the money; in the end the inducemnet took the form of an offer for Akerhielm’s son, who was destined for chancery service, to study at Oxford for three years at the expense of the English government. The fact that English money was involved remained a secret to contemporaries outside the small number directly in the know: William III, The Grand Pensionary (Raadpensionaris) Heinsius, the successive English Secretaries of State and William Blathwayt (some of whose Delft remains at Dyrham Park in Gloucestershire) , who served as Secretary of State during some of William’s campaigns on the continent, and the English diplomats in Stockholm. They stuck to the rule that ciphers must be used in correspondences that was not absolutely safe, and no names were divulged to the officials and financiers technically involved in the transactions. Even to later historians the regularity of the pension, the length of time it lasted, and the amount of money spent have remained unknown. In the Republic of the Seven United Provinces, even less is known about the giving of bribes in the late seventeenth century. William III and his Grand Pensionaries (Raadpensionarissen) tried to keep this as secret as possible and no written documents were kept. Officially, it was forbidden to receive bribes within the Republic, although this was a widespread tradition in Europe. Moreover, the Republic was an outsider when it came to preserving state secrets. Due to the political situation that the States of the various provinces all wanted to be kept informed of the secret state affairs towards which they were paying proportionately, the group of governors who knew about secrets in the Republic was far too big. In large parts of Europe, this open structure was looked at with concern. The oath of secrecy was therefore worth little in the Republic. The French envoy D’Avaux even claimed that neither in parliament (de Staten Generaal) nor in the States of Holland a mosquito could buzz without him hearing about it. The openness that arose as a result of things that should better be kept secret led to the fact that during a large part of the seventeenth century many European state affairs were not shared with the Republic. William III was very aware of this situation and decided in 1672 to keep many more things really secret from everyone with exception of the Grand Pensionary (de Raadpensionaris). For that reason, there is virtually no information about bribes paid to foreign rulers from the period during the reign of William III. For the purpose of financing the intelligence network, each region was charged for an amount in accordance with an agreed ratio. The province of Holland had to contribute 24,000 guilders at the time of the Witt and from 1674 to the end of the Republic even 74,000 guilders per year. The spending of most of these funds was in the hands of the Stadholder and the Grand Pensionary (Raadpensionaris), and they were held accountable for this. William III, however, kept this to a minimum. At least from this period some fragments of the source material with regard to espionage and the people involved have survived . In 1693 the city of Amsterdam complained about the lack of information. Heinsius responded: God help us! Experience teaches us that one could not treat matters too secretly or with too few people, because the enemies knew everything … that he was prepared to give all the information … but only when prudence that was needed in war was observed. Nevertheless, also on the Dutch side they were working hard on the Swedish case. The newly appointed Dutch ambassador there, Willem van Haaren (1626-1708), left in the early spring of 1690 with a considerable amount of cash to be able bribe high nobles at the court and on May 16, 1690 William III writes in this respect that he is willing to pay his part of 6000 guilders. Hastfers probably already received his share of the large amounts from the Dutch and English side in the spring of 1690 and it is plausible that he had already received donations in kind before this ‘gift’ in cash. An intercepted letter from Hastfers to the Swedish administration in April 1690 about the blockade of merchant ships showed how important he was. The letter was, possibly as support for the policy pursued and back up in case the high amounts that were paid, would leak, already published in 1694 in: Het leven en bedryf van Willem de Darde tweede stuk pp. 53/54, Amsterdam 1694. What the Dutch-English side in those years thought of Hastfers is also apparent from the report for William III by the English envoy in Stockholm, Duncombe. He names the ten most influential men at the Swedish court pro French except two who were on the Dutch / English side. Hastfers is highlighted in this report and called His Majesty’s Friend [Willem III] (1693). The sums paid increased all the time in the course of the war. In 1695 William and Heinsius were willing to spend up to 60,000 écus, paid in three substantial tranches of 20,000 écus each (the Republic paying one-third, England two-thirds), to win over the Swedes for military assistance however small, and so to obtain diplomatic advantage over Louis XIV in the peace negotiations. It is clear that the money spent by William III and Louis XIV in Sweden did not materially influence the policy of Sweden. But the expenditure was regarded as essential even after the opposite parties had seen the nature of the deadlock their competition had brought about. The very similar amount of money spent by William and Louis seems to be the symptomatic of the deadlock itself: fear that the other side might get a step ahead, rather than the wish for a positive outcome was the general form for most of the war. From the available documentation it is also clear that some moral restrictions even governed secret bribes. To be considered a man or honor it was necessary to avoid taking money from both sides. The money count Hastfers received from Louis XIV was in all letters from Avaux to Louis XIV earmarked ‘for peace’, a condition that peace would be made with his help, a circumstance which would transplant the ‘French money’ to the respectable sphere of ‘ rendered services’. For instance the most Fabian Cruel would accept from William, at a time when he was bitterly complaining or neglect by Louis, was a present of four clocks in 1695 . There is little concrete evidence about the giving of gifts as an introduction to the next step of large payments and promised pensions on the side of the Grand Alliance (primarily England, the Netherlands, Austria and Prussia). On the other hand, thanks to the intercepted letters from the French envoy in Stockholm, the Count of Avaux, and the cracking of the code in which they were made, the French behaviour is well known: a variety of beautiful and very expensive gifts and then huge amounts of money, ended up with the intended person in complicated ways via various in-betweens. As both the English / Dutch and the French tried to seduce the same small group of high-ranking people with gifts and sums of money, the Swedes were trying to have it both ways. Hastfers also received various amounts from Louis XIV from the end of 1693 through ingenious methods designed to keep these forms of bribery secret. Avaux’s letters clearly show how this was done and how this should be hidden from the outside world. In one case, the French bribery is about Count Hastfers and it is interesting for this story, although it is an incident that takes place about four years later. How were such payments made to keep them secret? “I had great pleasure in ascertaining the Count D asfert, that he might receive the eight thousand crowns without delay, that V. M. [Votre Majesté, Your Majesty Louis XIV] is willing to give to him. I have disposed him to receive them in France; but as he wishes it to be secret, and that he has no one in Paris to whom he can confide, to have them placed in the hands of Sr. Helisant, and he said, that he said, that Helisant had received such a sum for corn, which he sent from Riga to France, from which he had to withdraw the money, without his name appearing. Thus he will give me, in eight days, an order from Palemberg to Helisant, to have bills of exchange payable at Hamburg for eight thousand crowns, received in Paris, on which he will lose the exchange. That’s what he chose and found the best for him”. Although bribes often had to be kept secret because they were not allowed by the monarch, diplomatic gifts were a borderline between what could and should be seen and be kept secret. These gifts were intended to create a favorable impression on the recipient and often such gifts were the step towards a financial arrangement . In view of the foregoing, it is no more than plausible that these special pilgrim bottles were the first diplomatic gift to Jacob Johann Count Hastfers. Such a gift in kind was the usual ‘taster’ before receiving strictly secret financial donations, gifts that in the case of Hastfers had already started playing a role in April 1690. William III and Grand Pensionary Heinsius were already in the first months of 1690 busy on the Dutch side trying to win over high-ranking Swedes to the side of the Great Alliance. As mentioned, the newly appointed Dutch envoy in Sweden, Willem van Haaren, left in the early spring of 1690 with a considerable amount of cash to be able to bribe high-ranking nobles at the court and on May 16, 1690 William III writes in this respect that he is prepared to pay his part of 6000 guilders. The effort that Dutch/English diplomacy did to get some high ranking Swedes on their side in the diplomatic jousting to connect the Northern countries of Sweden and Denmark to the Great Alliance, make it plausible that these two Delft pilgrim bottles with the coat of arms of count Hastfers would have been the first diplomatic gesture from the Dutch side to the newly appointed count. This gift then took place during the months between the summer of 1689 and the early spring of 1690. The involvement of William III with all the details in diplomatic traffic and the small size of the Dutch and English administration taken into account, especially when it came to keeping gifts secret, make it plausible that William III himself had a hand in determining the shape and material of this gift. His knowledge and that of his wife Mary of Delft pottery was great in those years. For their new Dutch residence, Het Loo, as well as for older palaces such as Honselaarsdijk, they ordered many large pieces in Delft in the 1680s and they would do that again for Hampton Court in the 1690s. 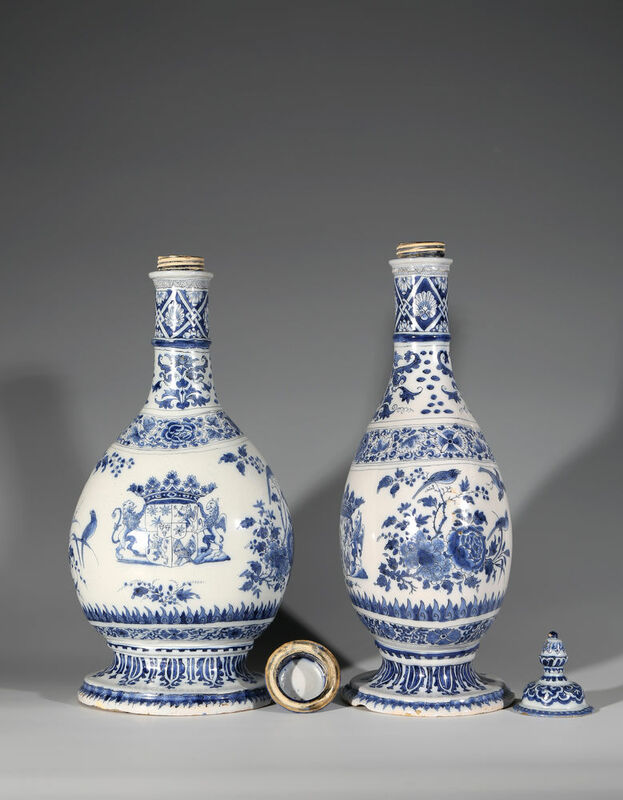 With these two intact pilgrim bottles complete with the original screw tops, two unique pieces of Delft earthenware have been discovered, which can be connected to two men: Willem III and his administration as a donor and Jacob Johan Count Hastfers, a Swede of high rank who needed to be won over to be on the Dutch/English side, as recipient. The crisis in the pottery Het Moriaenshoofd, limit the time frame in which the vases could have been given, the diplomatic and political complications of those years limit the period in which they can be have been made to several months in the transition of 1689 to 1690. Few objects come closer to the persons of the diplomatic entourage of the Stadholder King and very little Delft pottery can be dated so accurately, attributed to a pottery factory and to a specific painter. The vases have been preserved for the most part in the collection of the same family. After the death of Jakob Johann Hastfers in 1695, the vases were inherited by one of his daughters, his son had died at Namur in the fight against Louis XIV. No doubt the pilgrim bottles remained in the family and when around 1785 a descendant married a member of the Seton family, elevated to rank of nobles in Sweden in the second half of the eighteenth century, living in Ekolsund Castle, the vases were standing there on a stove. A family anecdote from the 19th century published in the Swedish magazine Svenska Hem in 1930 told how King Oscar came to visit and noticed the vases. He recognized it as belonging to the Hastfers family and told the Setons about the non-glorious historical deeds of their ancestor in 1788-1790 in the Swedish Russian War when this Hastfer was tried for high treason. Not knowing that this was a different not noble branch of the Hastfer family and that the vases were 100 years older. In 1912 the Seton family moved to Klingsta, a now demolished country house near Stockholm. The vases were in the salon standing again on a stove, next to a French-looking, but probably Swedish chest of drawers. One of the vases was when purchased and still is filled with tea leaves. Although the vases were only intended as ornamental objects on a buffet, it is possible that they quickly acquired a function in the Hastfers family and that they stored precious tea in them, a practical function as a large tea caddy. One chip in underside of foot restuck, no other restoration. Minor chips. Ordered in Delft as present for Jakob Johann Hastfers in 1689/90. Probably by inheritance trough one of his (grand) daughters into the Seton family. Since circa 1785 in the possession of the Seton family, Ekolsund Castle, Husby-Sjutolfts parish, Uppsala County, Sweden until 1912. Alexander Georg Seton sold Ekolsund Castle and moved to Klingsta Estate 1912. Klingsta Court, Danderyds socken, Stockholm County, Sweden. Inherited within the Seton family until present owner. 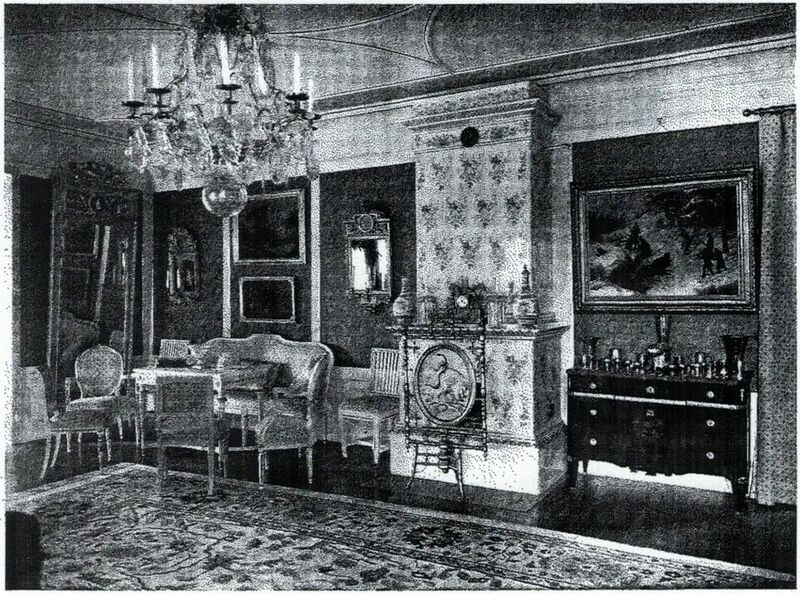 Albin Roosval, Svenska hem i ord och bilder, 18, Stockholm 1930, p. 212, pictured in the salon in Klingsta. R. Hatton, Gratifications and Foreign Policy: Anglo-French Rivalry in Sweden during the Nine Years War” in William III and Louis XIV essays 1680-1720 by and for Mark Thompson, Liverpool 1968 pp. 68-94. J. F. Chance, William Duncombe’s; ‘Summary Report’ of his Mission to Sweden,1689–92, in The English Historical Review, Volume XXXIX, Issue CLVI, 1 October 1924, pp. 571-587. Judikje Kiers, Fieke Tissing; met medew. van Jan Piet Filedt Kok… et al, De glorie van de Gouden Eeuw : Nederlandse kunst uit de 17de eeuw : schilderijen, beeldhouwkunst en kunstnijverheid, exh.cat. Rijksmuseum Amsterdam, 2000.